Set oven control to broil. Grease broiler pan rack. Place fish on rack in broiler pan. Broil with tops about 4 inches from heat 4 minutes; turn. 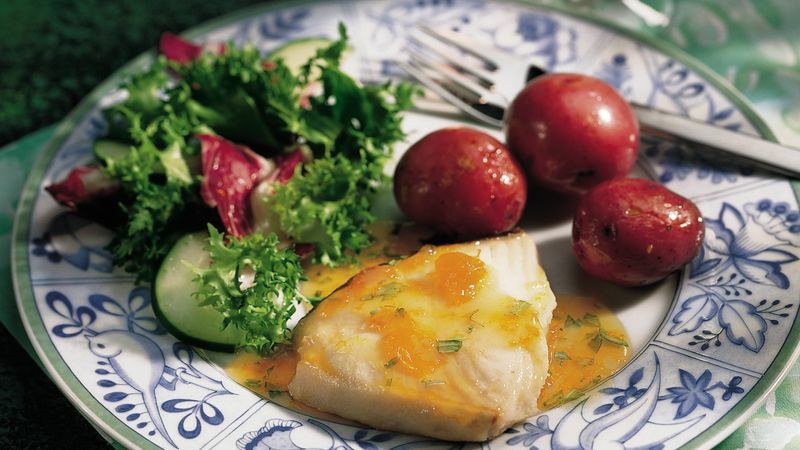 Broil about 4 minutes longer or until fish flakes easily with fork. Meanwhile, mix remaining ingredients; spoon onto fish. To grill: Brush grill rack with vegetable oil. Heat grill to medium heat. Place fish on grill rack. Cover and grill 5 to 6 inches from heat 10 to 20 minutes, turning once, until fish flakes easily with fork. Meanwhile, mix remaining ingredients; spoon onto fish during last minute of cooking. Fresh tarragon is popular in classic French cooking. Its strong, licoricelike flavor perks up chicken, fish and veggie dishes. Go ahead, get wild! Any flavor of preserves works in this recipe, so experiment with what you have on hand.